Looking for a new job is hard. It requires you to use new skills and conduct a bunch of research to garner the attention of someone who could potentially hire you. Like shoveling snow, your job search is going to be difficult. But you have to do it. This week’s summary will help. You’ll learn about some new LinkedIn features and hacks, how to find a real person to reach out to, plus see sample email messages to send to someone you want to network with and sample status updates for social media. I’ve also linked to a couple of articles I’ve recently written about how to get through the ATS. So here you go- overcome the difficulting of looking for a new job with some of these articles. Plus you can get mobile notification alerts for jobs you are interested in. There are some great tricks in here to help you use LinkedIn better. You’ll find hacks for formatting, extending your headline, adding a follow instead of a connect button and how to tag people you aren’t connected to. Do not send a general cover letter and resume to a company. Ever. It shows a lack of interest. Instead, follow these tips and learn how you can find a real person. For many MBA students, the main reason for getting this degree is to change careers. It can be done! Follow these five steps, put in the time and effort and see what happens. If you want to switch industries or careers, the best way to do this is to speak with someone who works in that field. This is referred to as having an informational meeting. Not only will you find valuable tips on how to do this, but also sample email messages to make the request. While this is written for businesses, it provides examples of the types of status updates you can use on different social media platforms. Use these ideas and alter them for your own personal brand awareness campaign! This is a list of job search resources ranging from general job hunting tips to workplace tips. They have cited articles written by many top careers experts. I’m happy to have one of my pieces included. There’s just not enough knowledge among job seekers on how ATS work. I hope this helps. You can also see my crowdsourced article on LinkedIn with more ATS tips. 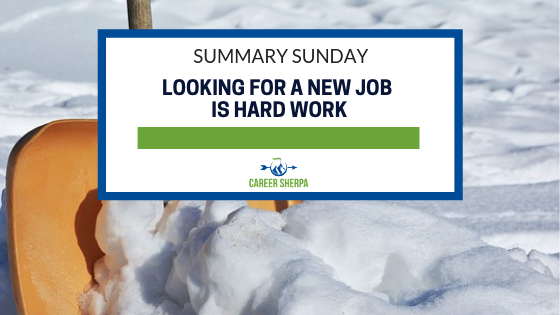 The post Summary Sunday: Looking For A New Job Is Hard Work appeared first on Career Sherpa .